I adore daisies in general so a giant daisy is what popped in to my head to use for the base of the Pay Attention hat my mother requested to wear in her classroom when she wants the students to listen and not talk. I will modifying this pattern to add a giant colorful butterfly at her request but this pattern is for the giant daisy on top of the beanie. I was pretty happy with how it turned out minus some of my horrible sewing skills to anchor it in to place. My hands really hate the sewing in part. Happy crafting! Use Easy Peasy Crochet Beanie Size of your choice. Once you have your beanie finished put to side while you work on your giant daisy starting with the yellow center. 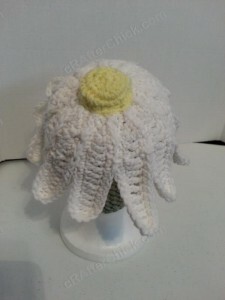 Pull yarn through leaving a long enough tail to secure your daisy center on to the top of attached daisy in assembly process before cutting off yarn. Round 1: In a magic circle, ch 1(does not count as a st) before making 12 sc in circle. Pull loosely closed so that ends touched but not pulled fully closed or tightly. Sl st in to the top of the first st in the round. 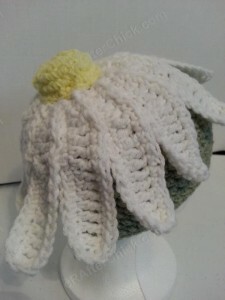 (12 sc) *This will be flower base you will branch your petals off of. Round 3: Starting with 1st ch-1 sp, sl st into space before creating a *chain of 17. Starting with the 4th ch from the hook work 1 tc in each of the following st until you are back at flower base working 1 sc into the last st before base. Sl st back into ch-1 sp you left off at. Sl st into next ch-1 sp. * Repeat from * process around in each ch-1 sp until you are back at beginning. Sl st in to the base of the first st in 1st petal. Round 4: Ch 1, then working around the whole flower place 1 sc in to each st around and putting 3 sc in the end of each petal to round them out. 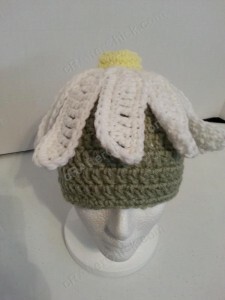 Pull yarn through leaving an extra long tail to attach it to beanie. 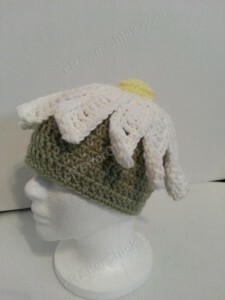 Daisy: Using your large blunt eye yarn / tapestry needle and the long tail left from daisy in previous step, sew your daisy on top of your beanie hat. I centered mine right on the center of round 1 circle at top of hat and it worked out pretty well there for me. 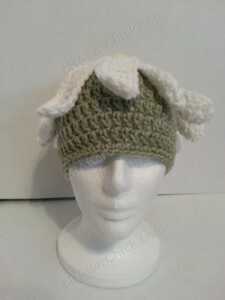 Once you have fully secured it to the hat, pull yarn through to inside of hat before fastening off. 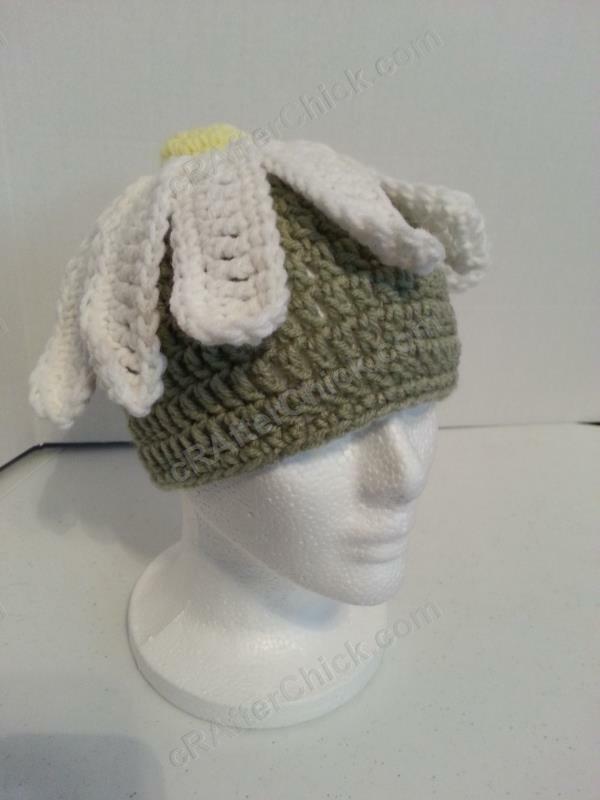 It’s up to you on how far down you want to sew the daisy. For mine I sewed down each petal about 1/3 of the way, back up to flower base, then down next petal etc. Daisy Center: Take the yarn tail that you left off for assembly on the yellow daisy center and using your yarn needle start stitching in to place over the center circle of your daisy flower. 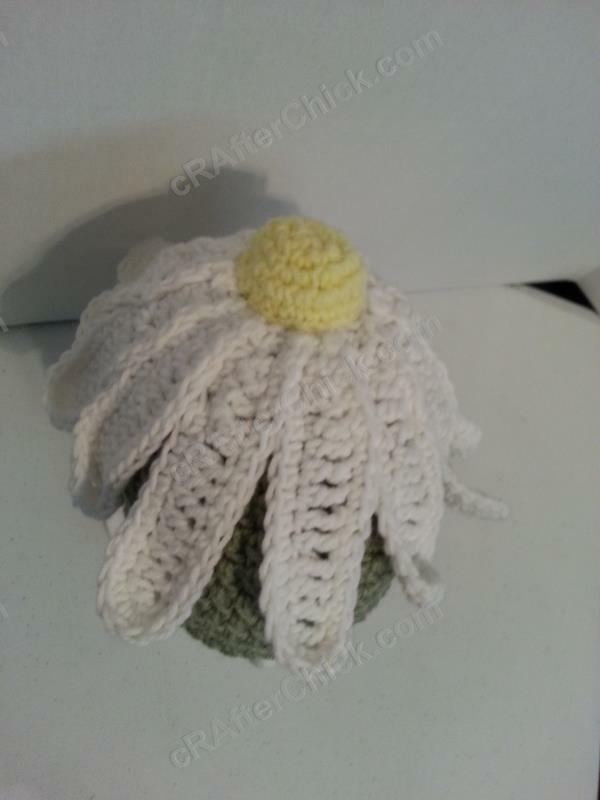 About halfway through stitching this into place start adding small amounts of fiberfill stuffing to give your flower a more 3D appearance. 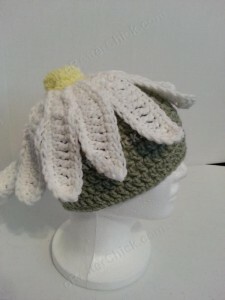 Once you have secured it fully in place and stitched closed, pull yarn through to inside of hat before fastening off. There you go. 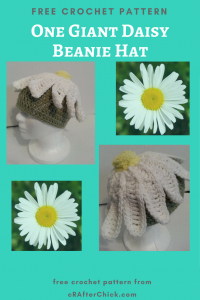 If you followed all the steps your giant daisy crochet hat should be complete and ready to wear!